This laptop is an essential tool on Dave Beck’s farm. He uses it to design maps to apply different doses of seed, water, and fertilizer on his fields. Precision agriculture started with satellite-guided tractors and maps recording pinpoint levels of grain yields during harvest. But farmers like Dave Beck are taking the next step. Beck’s machine shop is filled with some of the old tools for farming like wrenches, metal grinders, and air compressors. But sitting on a steel slab of a welding table is one of the new tools: a laptop computer loaded with specialized software. On the laptop, Beck has access to a detailed planting map for one of his irrigated fields. It shows a bright green circle inside a dark red square. The map tells Beck’s planter to drop more than double the seeds in the green area covered by sprinklers than the red corners where the water doesn’t reach. Depending on the soil, rainfall, and past yields, farmers can program maps to apply different amounts of seed, water, and fertilizer to the land instead of blanketing fields with an arbitrary amount. Now that retailers from Walmart to Whole Foods are putting a critical eye on fertilizer use in food production, it pays for farmers to be precise. But the big payoff is still out there if farmers are willing to embrace what’s known as “Big Data,” datasets so large they’re able to offer deeper and more nuanced insights. 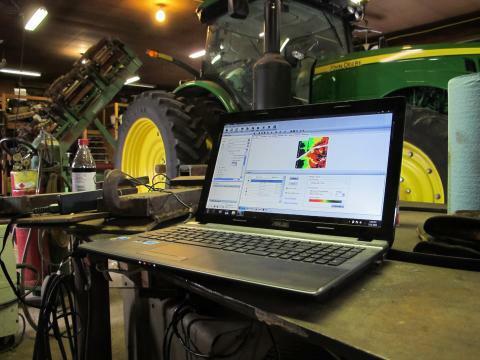 If farmers combine all of the precision ag data they’re gathering, researchers, scientists and consultants could be able to draw new, important conclusions. Purdue University agronomist, Bruce Erickson, says even with all the precision technology, there’s a lot of trial and error on the farm right now. The answers would be clearer if farmers pooled their results. “We mine the information from farmers’ fields sort of like Google mines information from our mouse clicks and Walmart mines from when we purchase certain products,” Erickson said. That would be a treasure trove for seed companies. It could help speed up research and establish a track record for new seed varieties. “People are thinking whole farms could be our research plot versus doing a specific study in a corner of a farm,” Erickson said. Farmers could make decisions based on neighbors’ real results. They could tell if people who got great yields with a certain corn hybrid also liked a particular variety of soybean, just as Amazon recommends books you might like based on your purchase history. But that’s where the Information Age gets bogged down in the nitty-gritty. If their data is sold, will farmers get a cut? What if there’s a security breach like at Target? Those concerns are enough for many farmers to keep their data between themselves and close advisors. “I think there’s a distrust of the major corporations of, ‘O.K., what are you going to do with my data?’” said Brandon Hunnicutt, a farmer from Giltner, Neb. If the data could put seed companies and fertilizer manufacturers years ahead, where will it leave farmers? “Someone else is probably profiting from it and (farmers) feel they should share in that,” said farmer Lon Bohn of Gibbon, Neb. At this point, digging into data could represent the next big step forward for U.S. agriculture, but only if farmers feel safe taking the plunge. That’s why the Farm Bureau, the country’s largest farm group, hashed out a new policy for sharing farm data in January. It includes the right for farmers to delete their data whenever they want. As farmers become more comfortable with precision technology it may only be a matter of time before sharing data becomes second nature. Lon Bohn says when it comes to technology, farmers don’t like to be left behind. “There’s always one farmer in the community who’s twenty years behind everybody else and they don’t want to be that guy,” Bohn said. But for now, most farmers are taking a long, hard look before they leap into Big Data.